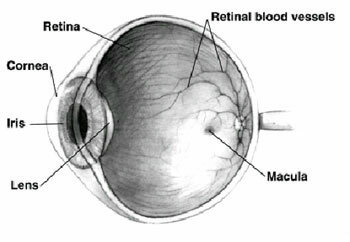 The macula is a part of the retina, the light-sensitive layer of tissue at the back of the eye that is similar to film in a camera. As you read, light is focused onto your macula. There, millions of cells change the light into nerve signals that tell the brain what you are seeing. This is called your central vision. With it, you are able to read, drive, and perform other activities that require fine, sharp, straight-ahead vision. When multiple cyst-like spaces form within the macula and result in swelling of the retina, a patient may be diagnosed with cystoid macular edema or CME. This painless disorder is often discovered after a patient has complained of increasingly blurry vision, especially when reading (deterioration of central vision). Peripheral vision is usually not affected. The reason why people are affected by CME is unknown. The most common reason someone might develop CME is if they have had recent cataract surgery. Other causes of CME include diabetic retinopathy, uveitis and retinal vascular disease. In these cases, it is not uncommon for patients to experience swelling of the retina. Currently, over half of all patients diagnosed with CME can expect significant improvements in their vision after treatment. Treatment may take up to a year for full effect.